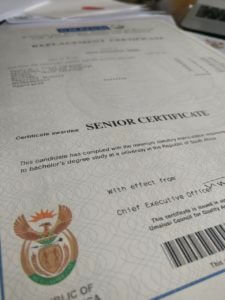 A senior certificate that can be verified by Umalusi. Getting your academic qualifications and certificates verified for use abroad can be a tricky process, but if you know all the ins-and-outs, you will have a much easier time getting all your “docs in a row”. On this page, we will be taking a look at what it entails to get your academic certificate verification done, how to do it, and who can help you with your administration. Which authority verifies academic qualifications? Umalusi has records of all learner achievements from November 1992 to date, but if you have a certificate that was issued before 1992, you will have to get it verified by the Department of Basic Education (especially for schooling qualifications) or the Department of Higher Education and Training (DHET for vocational and adult qualifications) as appropriate. Can I get in touch with Umalusi for academic qualification verifications? Members of the public cannot apply for the verifications of their academic certificates directly with Umalusi, but should instead do so through an agency. We can assist you with this. See our pricing. Academic qualification verification letter that goes with an with apostille. How does Umalusi verify academic qualifications and certificates? Umalusi requires a certified copy of the document to be verified along with a certified copy of the requestor’s ID document or passport. When applying for verification of academic certificates, your application has to clearly state the embassy/country and the information of the requestor as follows: Embassy / High Commission / Consular Name and address; name and surname of the requestor; ID number; contact number; email address; and contact person. Umalusi strives to ensure completion of the verification process within a 24-hour working day, which theoretically comes down to three days. This is not always the case. Once the request has been finalised, your verified academic certificates will be sent to the Legalisation Section of the Department of International Relations and Cooperation (DIRCO) to be apostilled. What can Umalusi not verify? Academic certificates issued before 1992, in which case you will need to go to the Departments of Basic or Higher Education (part of the DHET). If the results have not yet been certified, the requestor will be referred to the Departments of Basic or Higher Education and Training for verification purposes as Umalusi can only verify those records which have been certified. Educational qualifications obtained through higher educational institutions and training facilities need to be verified by the Department of Higher Education and Training. You will have to submit the original certificate along with copies to the Department, as the relevant section will stamp and sign a true copy of the certificate and issue an original covering letter confirming that the educational institution is a recognised institution in South Africa. If the institution you studied with is not registered with the Departments of Basic or Higher Education and Training, you will have to get your academic certificates verified using the route of the Public Notary / Registrar of the High Court. 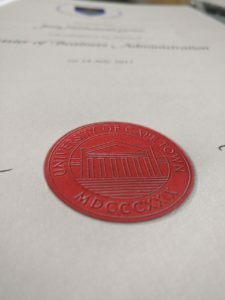 An academic qualification apostille from the University of Cape Town (certificate). How do I get my academic qualification apostilled after being verified? Once DIRCO has received your academic certificate and the letter or verification from Umalusi or the DHET, it can then be apostilled and collected. 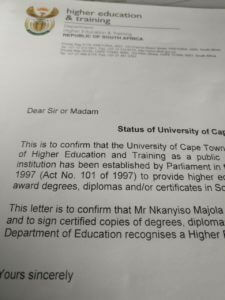 Academic institutions often require a letter from the DHET as proof that the qualification was granted by a verified institution. Sometimes, each university degree earned much be apostilled, meaning that for someone with a Bachelor’s degree, an Honours degree, a Masters and a Doctorate, four apostilles are required. This means a great deal of effort on the part of the applicant, especially if each was granted by a separate institution and often it is the case that each was from a different country. Academic qualifications and certificates are important documents and are best kept safely. Do not laminate them, however, since they cannot be verified in such a state. Keep them in a plastic sleeve or folder. Obtaining replacement or duplicate certificates is often a very tedious process as academic institutions try very hard to prevent forgeries. Important for those wanting to apostille qualifications from UNISA. You will require a letter that we cannot obtain for you and you must get yourself. Download the letter form here: UNISA qualification verification letter. Once you have this letter, send it to us with your UNISA degree so that we can obtain your apostille for you. It is obvious that having an academic qualification certified or apostilled is a great deal of effort and often a long waiting period, through many intermediaries. Our team has navigated this verification many times and very successfully. Save yourself the hassle, and use our services. See our pricing.